A good office chair is a vital tool for the office worker and choosing the most appropriate office furniture is critical at office fit out stage. We are often asked what standards should office chairs comply with in Ireland. As a minimum requirement all office chairs in Ireland have to comply with the dimensional requirements of BS EN 1335 Part 1. This does not help the customer differentiate between the different ranges of office seating available. This is particularly true nowadays as practically every office chair on the market is referred to as ergonomic office chairs, regardless of whether they deserve the ergonomic chair title or not. Seat depth shall be adjustable. The seat inclination must be adjustable by at least six degrees. Seat height shall be 400mm minimum and the adjustment range should be at least 120mm. Adjustments of the backrest are independent of the seat surface. Armrests should be adjustable in height, depth and width. These chairs are suitable as operator task chairs and executive office chairs. These chairs are suitable as operator chairs and executive chairs and organisations who wish to implement good preventative healthcare. Chairs for Large and Small users. Office Chairs for large people are chairs designed with the larger user in mind and must fit correctly and offer optimum support. 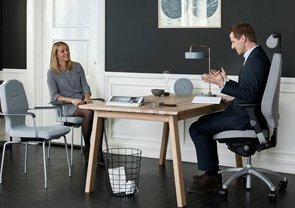 Chairs for Heavier People – where standard chairs are not suitable. This is the most common office chair sometimes referred to as office task chairs. Type B chairs can have independent backrest adjustments in relation to the seat surface, but it is not compulsory. The backrest should be adjustable in height to ensure the lumbar area is properly supported. Dimensionally, they are the same as type A chairs except for the minimum seat height, which is 420mm and the minimum seat height adjustment range, which is 100mm. The mechanism should allow and promote movement but yet maintain constant support with the lumbar area. Seat depth adjustment is optional. Arms are usually not adjustable and offer little if any support. Type C chairs often tend to be very large chairs with bulky upholstery and limited adjustability. These chairs may or may not satisfy the minimum requirements of the VDU regulations.